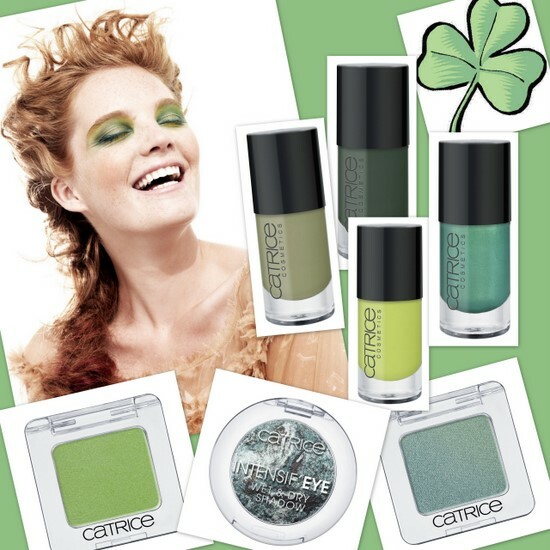 Go Green for St. Patrick's Day, with Catrice! Forget pretty in pink, let’s get gorgeous in green! It’s St Patrick’s Day tomorrow and many of us, myself included, like to give a nod to the wearing of the green, by adding a flash of the colour to eyes or lips. So with the day that’s in it I thought I’d share these recommendations from one of my favourite budget brands, Catrice. Two of the pictured polishes are from the Nymphelia collection and are a snip at €2.79; the colours are inspired by ‘the nature and mysticism of the world of nymphs’. The acid green (810 in Acid/DC) and deep ivy green (740 in King of Greens) are also €2.79 and both available within the standard line. That circular Intensif’eye Wet&Dry Shadow, €4.29, is also from the Nymphelia collection and I featured it in this post on beaut.ie – it’s a fab dupe for Estee Lauder’s Cyber Teal. It's flanked by Catrice's Mono Eyeshadows in I Think I’ve Green You (left) and Kiwi Wonder (right, €3.29 each), which will also give you the perfect St. Patrick’s Day look. Will you be wearing green for Paddy’s Day? Beautiful posts and blog! Love your sense of style! Would you like to be friends and follow each other? Happy St Patricks Day Emma! I'll be going green for sure! I love Catrice, wish they sold online though! Green is actually one of the only colours I wear in eyeshadow, when I mangage to veer away from grey or browns! So pretty! I don't think I've ever tried green eye shadow, but this makes me want to give it a go. The right green shadow really makes the eyes pop! Great colors and very festive! It will be green eyeshadow for me tomorrow I think - Mac's Green Smoke. I have never worn green eye shadow before. Love catrice can't pass the stands without picking something up!! !